1. Boil the crabs until done, keep cool for a minute then remove the meat, and set aside keep the crab shell into one side. 2. Sauté the brown, crab meat, prawns. Season with salt, pepper place on mixing bowl; add with beaten egg, flour. 3. 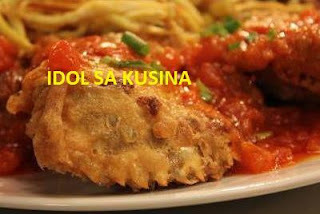 Stuffed into crab shell, then deep – fry until golden, then place on plate on the side with chilli tomato, butter. 1. Melt the butter into pot add tomato crushed chili sauce. Season with salt and pepper.